I’m not really sure what took me so long to try this cult-classic, but I finally caved and picked up the Estée Lauder Double Wear Foundation to see whether it truly is, the sh*t. Everyone I know that has tried this foundation absolutely swears by it, and most reviews that I’ve read or seen have been very impressive. I guess what really reeled me in was the fact that most people say that it stays on and looks flawless for hours on end. I don’t really wear foundation on a daily basis, but when I do, that’s essentially what I’m looking for, given that my days are usually very long meaning I’m wearing my makeup for at least 8 hours. 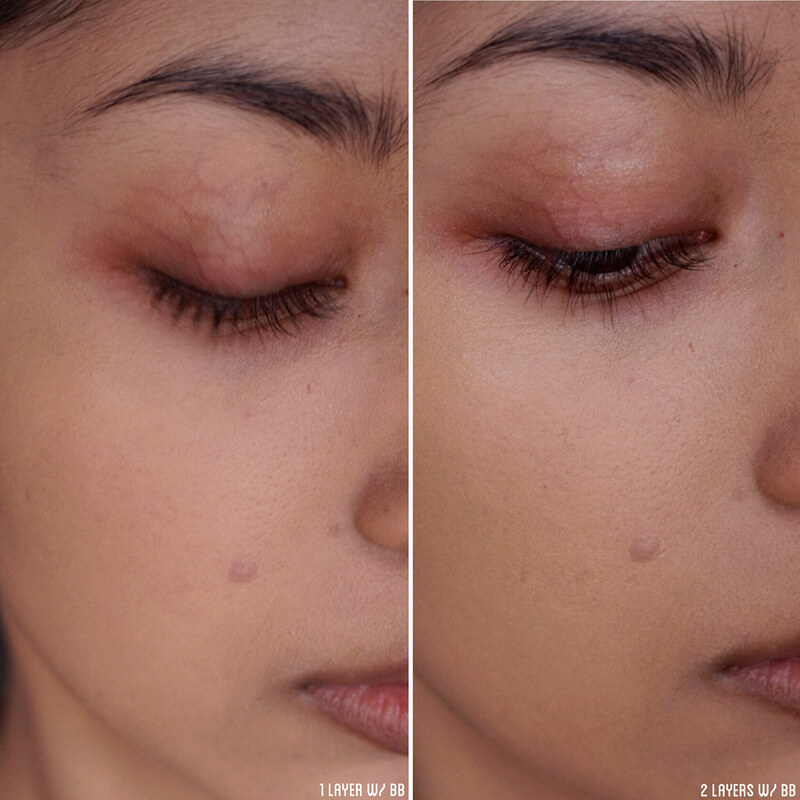 Well, I definitely put it to the test, and if you want to know my thoughts on this foundation, you know the drill! The Estée Lauder Double Wear Foundation is available to purchase at most department stores that carries Estée Lauder and Sephora. It retails for $46 CAD and comes in 38 shades. The shade range is quite expansive and includes shades and undertones for both very pale and very deep skin tones, along with everything else in between. However, not all stores carry all 38 shades, and I believe only the Estée Lauder website carries the entire range. I picked up the shade Rattan (2W2) which is described as a “light to medium with warm beige”. I originally picked the shade Cashew (3W2) which is described as a “medium to golden warm beige”, however it is way too dark and yellow on me at the moment. Proven 24-hour staying power. 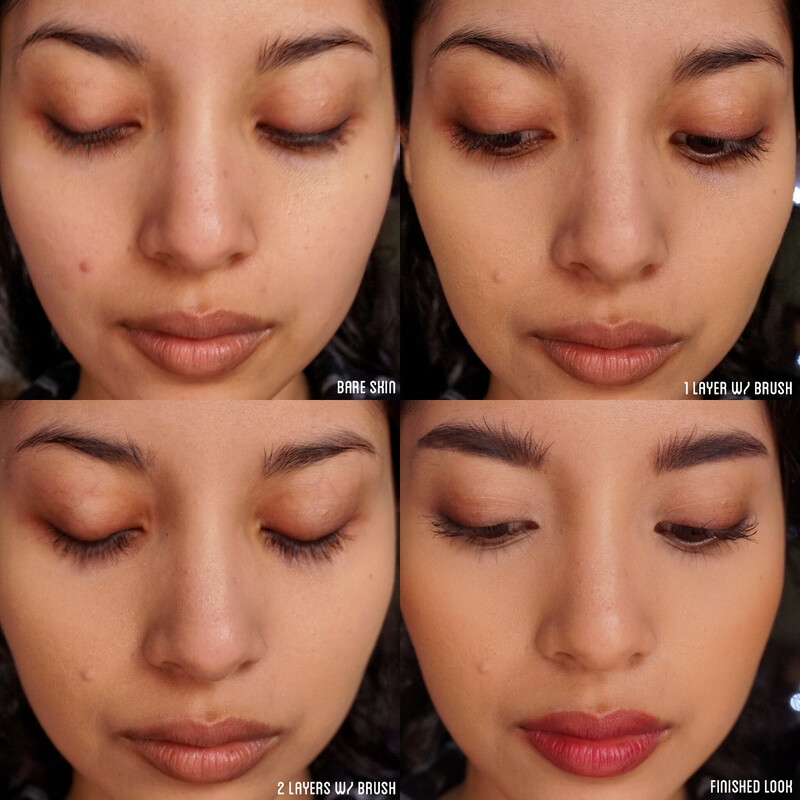 The same long-wear makeup you love, now proven to last even longer. Looks flawless and natural. Feels lightweight and so comfortable, you won’t believe it’s super long wear. Won’t change color, smudge or come off on clothes. Lasts through heat and humidity. The packaging is very simple and elegant. However, it doesn’t come with a pump, which is a bit of an inconvenience, but luckily the MAC pumps fit onto this bottle nicely so that can easily be fixed if it really is a bother. The formula of this foundation is surprisingly not as thick as I anticipated. It was definitely not watery, however it felt almost gel-like. It doesn’t have a fragrance to it either. 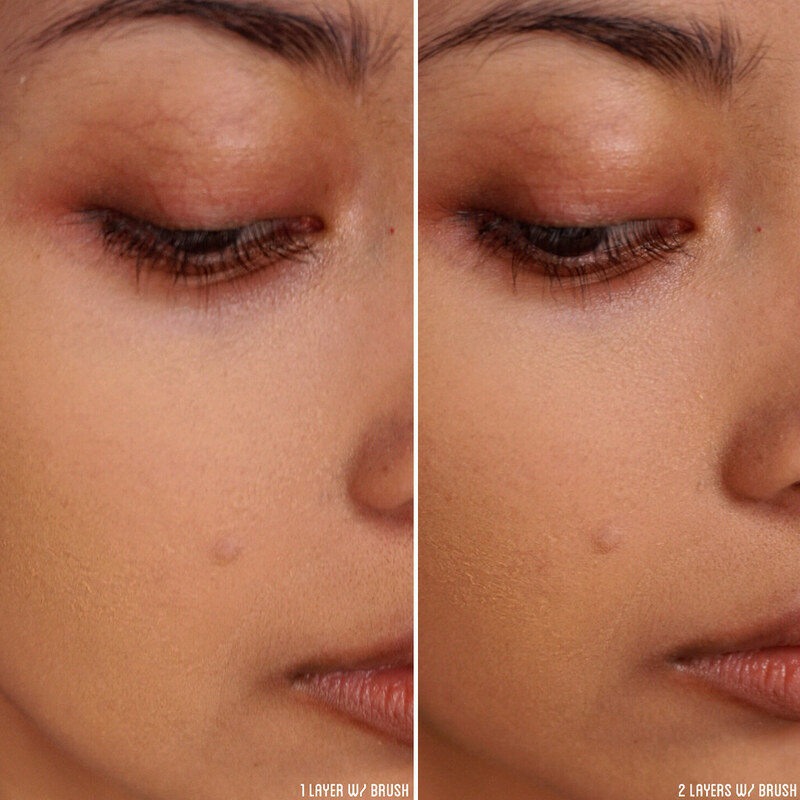 After applying one layer, both with a Beauty Blender and a brush, it gave a medium coverage to the skin, however using a brush gave it a bit more coverage. It was very easily to blend into the skin and it was very easy to build up to a fuller coverage after applying a second layer of foundation. 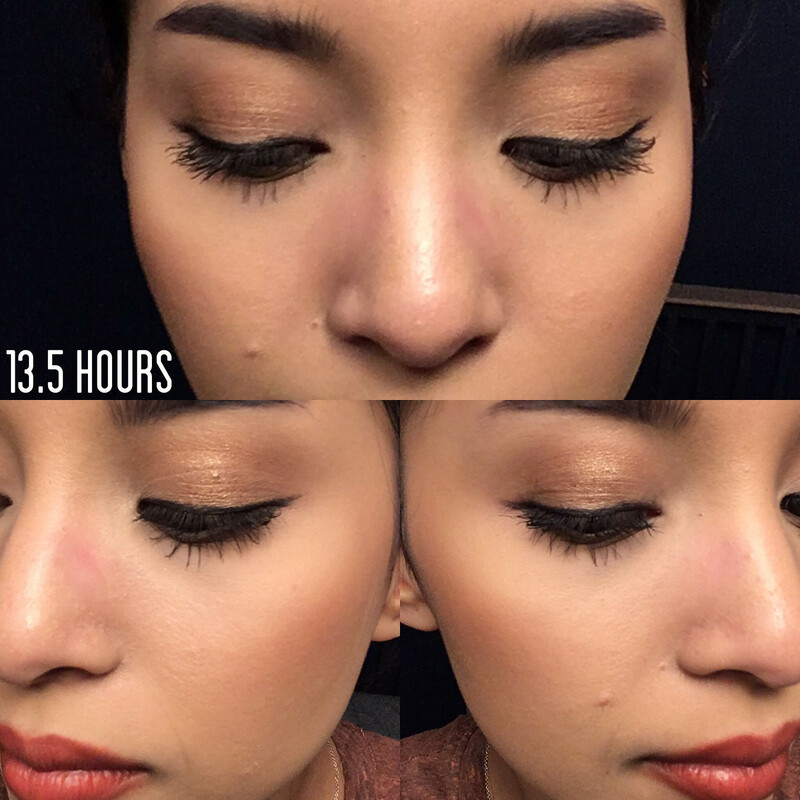 I applied the Hourglass Veil Mineral primer to the right side of my face (the side with the zit that decided to pop up just in time for this review), and I didn’t find that it helped with the application of the foundation much compared to the side that I had no primer on. One thing I definitely want to point out is how easily this foundation clings to dry patches. I had some serious flakes going on at the time I was trying this foundation, and it really accentuated those areas no matter how well I prepped my skin beforehand. When using a brush, I found that those patches looked even worse, so I did have to spray my face quite heavily with some MAC Fix+ so that my face would look acceptable for the rest of the day. Apart from that, however, my skin looked pretty good. With both the brush and the Beauty Blender, I wouldn’t say that this foundation gave the fullest coverage, but it did provide an even base, and it initially looked quite natural on the skin as well. The rest of my makeup applied very well over the foundation, and I didn’t even have to set my face with a powder because of how much it dried down. For both days, I did not use a setting spray and I did not use a powder to set my foundation. 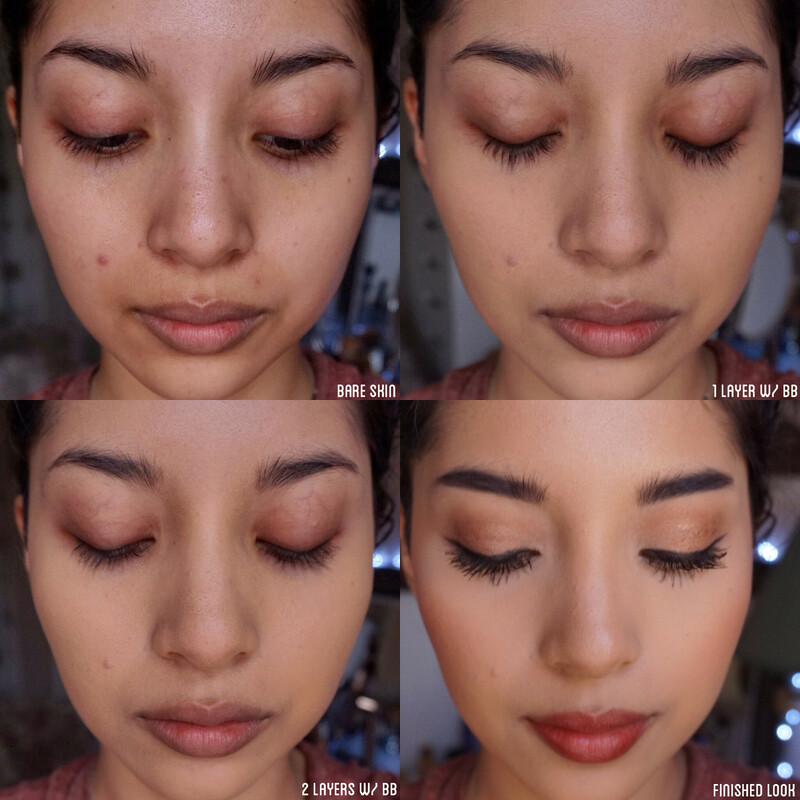 On the day that I applied the foundation using a Beauty Blender, I noticed that after a few hours, my skin was not oily and did not need any touching up, however my face looked a bit dry and dehydrated. The lines of my face were accentuated, however the foundation didn’t crease. 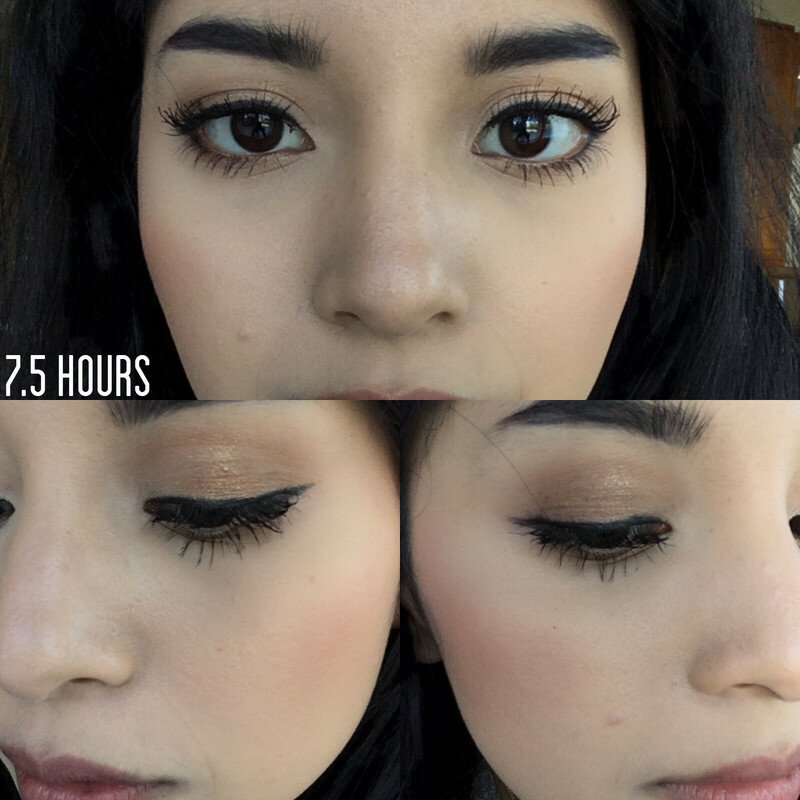 After about 7 hours, my makeup basically looked the same since my initial check-up. Again, lines were accentuated but there was no product creasing and my foundation did not fade at all. My face was not oily and did not require any touch-ups. I had a pretty long day and ended up wearing my glasses, and after about 13 hours, my makeup looked alright. I wasn’t as oily as I normally would be after that long without any touch-ups, which was very impressive, however my face didn’t feel very comfortable and it looked like all the moisture was sucked out of it. The areas where my glasses rubbed on the skin had no more foundation, as expected. There’s nothing that can be done to avoid this so I wasn’t expecting anything other than that. I didn’t notice a difference between the side where I had primer vs. the side with nothing on, and I also did not notice any oxidation of the foundation. 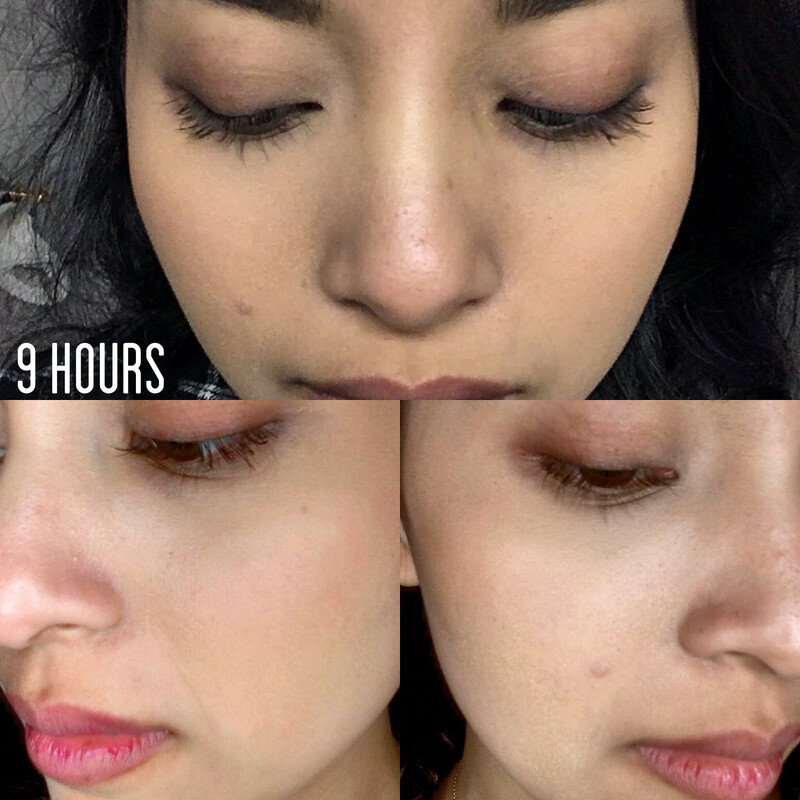 The next day, I applied the foundation using a buffing brush by Sephora. 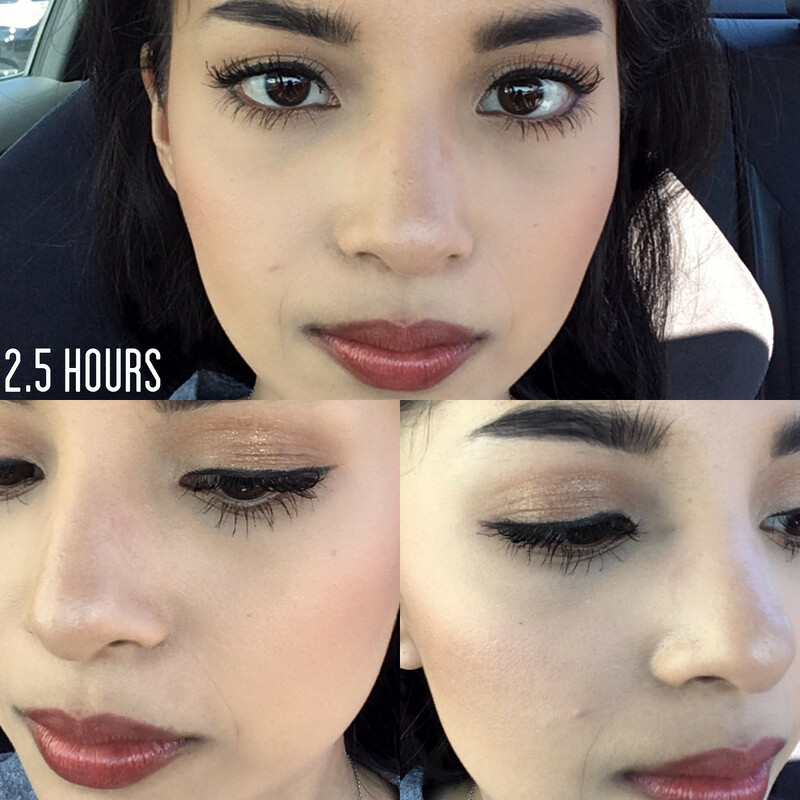 I applied primer to the same side of my face (right side with zit), and right away I noticed that applying with a brush gave more coverage. Once again, I did not notice a difference in how the foundation applied on the side with and without a primer. I had to spray some MAC Fix+ to get it to look somewhat presentable since it clung onto some dry patches very badly. The foundation didn’t wear quite as well as the day before, partly because I was napping most of the day so it rubbed off quite a bit. My face wasn’t very oily after about 9 hours of wear, but it looked quite dry and made my skin look very textured. There was no difference between the side that was primed and the side that had nothing on it. I think this foundation lived up to the hype of it being a very long-wearing foundation. It is probably the only foundation I’ve ever tried that actually kept the oil at bay over several hours. I was really impressed by how well it held up over the entire day. It isn’t a natural-looking foundation by any means, but it wasn’t cakey at all. I didn’t really like how it clung to my dry patches, but I think this is a foundation that would work very well in the summer time when my skin is more oily. I don’t think this is something I would wear every day since it is so heavy-duty, but I think it would be great for very long days and for the summer. As for the shade, I found that Rattan was a good match, however it was slightly too light for me. The next shade down, Cashew, would’ve been too dark for me now but would probably be a better option for me when I’m more tan in the summer. Shade comparison between similar foundations in my collection. 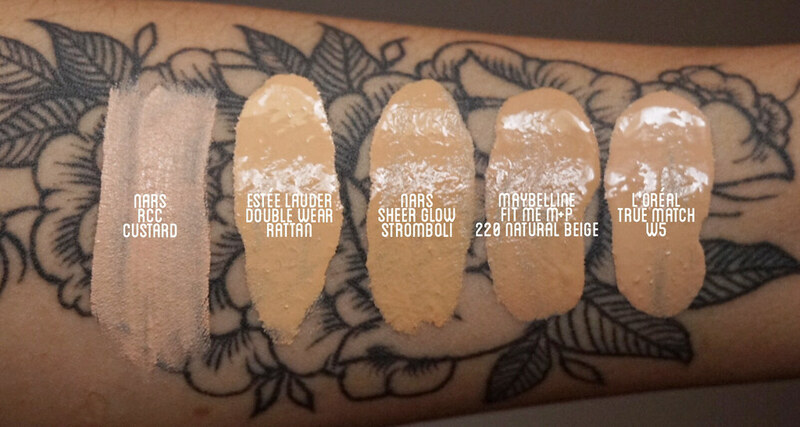 L to R: NARS Radiant Creamy Concealer in Custard, Estée Lauder Double Wear Foundation in Rattan, NARS Sheer Glow in Stromboli, Maybelline Fit Me Matte + Poreless in 220 Natural Beige, L’Oréal True Match Foundation in W5. I would recommend this foundation for those who have combination to oily skin, and for those who are looking for something very long-wearing with good coverage. It doesn’t really look natural or has a skin-like finish – it definitely looks like you’re wearing makeup, but it doesn’t feel like you’re wearing a mask of makeup and it’s fairly lightweight as well. It has a very interesting formula which I like for the most part. Overall, I would absolutely recommend this for those with oilier skin looking for something that will last them all day. 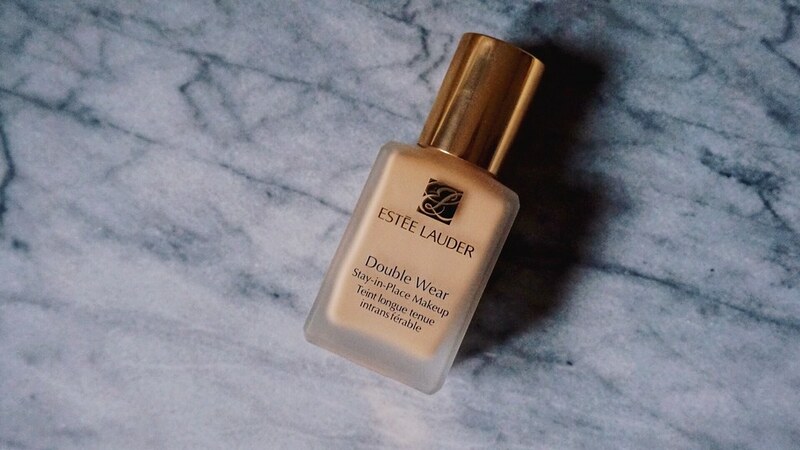 Have you tried the Estée Lauder Double Wear Foundation?